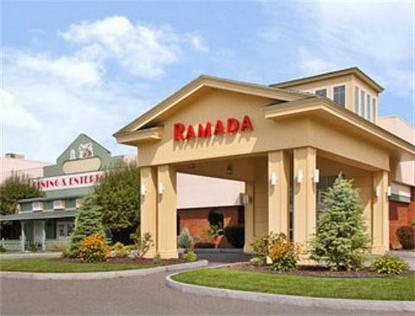 The Ramada Conference Center Lewiston is located in the Lewsiton-Auburn metro at Exit 80 off the Maine Turnpike. The Ramada Lewiston hotel is ideally located minutes from Bates College, Colisee Civic Center, LL Bean, and the largest Wal-Mart distribution center in New England. The Ramada Lewiston is just twenty-five miles North of the Portland International Jetport Airport. The Ramada Lewiston is the only 100 per cent smoke free hotel in the Lewsiton-Auburn area, and the only full service Lewiston hotel. This Lewiston hotel offers a state of the art 15,000 square foot conference facility with ten meeting rooms and a unique theater room. Lewiston-Auburn travelers will also enjoy the free high-speed internet access, indoor heated pool with Jacuzzi, and dining at our restaurant, Dudleys. When Booking Best Available breakfast isn't included.